4 Beds 3 Baths 2,514 Sq. ft. Welcome to 103 Tamarac Ave showcasing the ''Arborgate'' Bonus plan built in 2015 by David Weekley Homes. Extra care was given to choosing the interior options of Coffee Bean color wood floors in the foyer, private study, walkway, kitchen, dining room & family room. And also to the upgrades to the bathroom counters & cabinetry, lighting, fans & don't forget to peek into the "Lil Man Cave" in the mudd room! Coffee Bean color wood floors, tile in baths, study with french doors for privacy, open concept-plan with a "eat-up" granite island that's sure to be THE place to hang out. Super shower in owner's retreat, the kids or grand kids will love the "Lil Man Cave"! The open-concept plan boasts an "eat-up" island, beautiful Maple Nutmeg cabinetry, stainless steel GE appliances, granite counters - that all make it THE place to hang out! The Owner's retreat has double doors that lead to the bathroom featuring the ''Super Shower'', double sinks & a huge walk in closet. The 4th bedroom is the upstairs bonus room with private bath & walk in closet. Additional amenities include french doors on the study, extended screened lanai that's perfect for relaxing, watching TV or entertaining, whole home gutters, security system, front exterior lights, 5 1/4" baseboards, structured wiring, transferable termite bond & a 6' privacy fence. 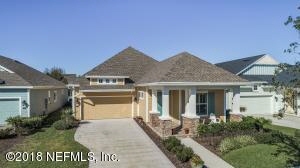 Nocatee offers you all that you can imagine from schools, community parks, splash water park, zipline, fitness center, green-way trails, kayak launch, electric vehicle paths & monthly events to suit your needs. The HOA fee is $250/yr, the CDD is $1873 and paid with the tax bill. Come home to 103 Tamarac Ave today you'll be glad you did!